I’m super excited to introduce you to, Sunanda Nair! Sunanda and I were trying to remember how we first met, but settled on some networking event many moons ago. The funny part is I’ve known her wife Melissa way longer since we were both among the early users of Yelp when it first launched in Boston almost 15 years ago! Sunanda and I recently reconnected on LinkedIn when I gave our previous Filipinos in Boston women a shout out on International Women’s Day because I wasn’t seeing many Asian / Filipino women being highlighted on speaker’s lists in Boston and beyond. Thanks again to Sunanda for being a part of Filipinos in Boston, and I hope you all enjoy reading her interview! Photo provided by Sunanda / Sunanda (far right) with her parents. Where are you and your family from? Sunanda: My mother is from the island of Bohol in the Philippines, and immigrated to the US after nursing school. My father is from Kerala, a state in Southern India. The majority of my mom’s family is still in Bohol and Cebu. When we go back, we always stay in Bohol but we stop in Cebu to see extended family on the way. Both my mother and father are close with their families, so as a child I visited their homelands every other year on a rotation. I was born in India but truly feel close to both my Filipino and Indian sides. I grew up around a lot of Filipinos and Indians in the Detroit area, and most of our meals were either South Indian or Filipino cuisine. It was a treat when we got “American” foods in the house for dinner. Although I still prefer the food I grew up with. I could eat rice with literally every meal. Sunanda: Currently I work at Privy, a tech company in downtown Boston. I am a Senior Account Executive on the team. You’ve got an interesting resume that’s taken you from non-profits to for-profits, startups and public companies. Can you tell us more about your career journey and what led you to Privy? Sunanda: So my career trajectory is a winding one. I went to school for cognitive science and landed my first job abroad in India doing HIV / AIDS research at the largest government hospital in the country. After that I came back to the US and split my time between playing poker online and working for non-profits and NGOs. I landed in Boston accidentally because my close friend was moving here, and I came along for the ride on the moving truck. I hung out here for awhile before deciding to take a summer certificate program at Boston University in public health. After finishing the program, I found myself working for an organization called Massachusetts & Asian Pacific Islands for Health (MAP for Health) doing program management, and research with the Massachusetts Department of Health and the CDC. The focus was on HIV / AIDS awareness and prevention in the Asian community. 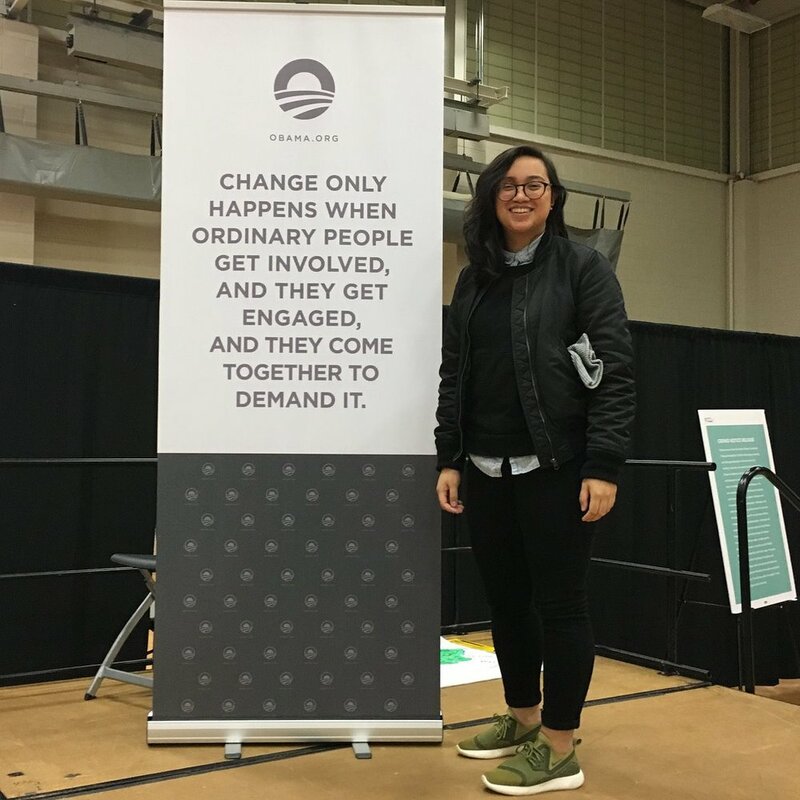 After MAP I worked for MataHari, a local Boston organization that works with diverse communities with a mission to end gender based violence and exploitation. While I was there I started to really enjoy marketing and took on a part-time internship as a social media marketer, which then turned into a part-time job. Because of that I started taking on consulting projects doing marketing and lead generation for various small businesses. While that was great, I realized I wanted some benefits like healthcare so I decided to apply for full-time marketing roles. I was able to secure an interview at a small startup that had no VP of Marketing, so the VP of Sales interviewed me. Two days after my interview he offered me a sales job and I thought he was legitimately crazy. However, he challenged me to take a risk and I took it. I’m lucky that he was a great coach and mentor. I quickly learned I loved sales, even though it was really hard. That first sales job was all cold calling and even door-to-door sales. From there I went to a few more startups, and landed at one that was acquired by IBM. I spent 2 years at IBM and then wanted to go back to small company life and back to sales. I worked with Wistia for 2 years, which was amazing, but an opportunity to join Privy presented itself and it felt like a challenge so I took it. I love where I am right now, but can’t wait to see what the next 5 years have in store for me! Photo provided by Sunanda / Sunanda with her 2 y/o son Rishi. Sunanda: I moved to Boston in 2009, spent half a year in NYC and then ended back up in Boston. So almost 10 years! Wow, that’s crazy for me to type out. Sunanda: I love the Boston Common and Public Garden in the summer. It seems a little cliche but it’s a great place to have a picnic, walk around when the weather is nice, and just enjoy the urban park. Now that I have a son the Frog Pond is the best thing to go to on hot days. Also, I love love Winsor Dim Sum Cafe in Chinatown. It’s been one of my favorites for years. I hesitate to share this secret but in my opinion Charlestown is one of Boston’s best kept secrets. I lived there for almost 3 years, and it’s like a mini town right next to the city. It feels like a community. I knew my neighbors, some who have lived there for 50+ years. 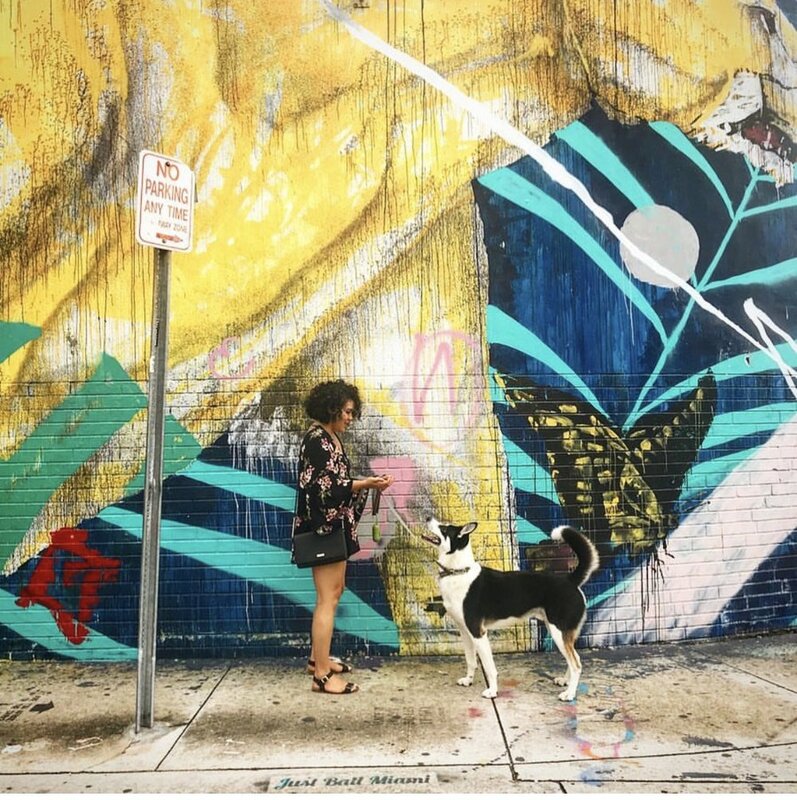 There are tons of parks, a brewery, a growing restaurant selection, and you can walk to the North End in about 15-30 minutes depending on where you are in the neighborhood. What's your all time favorite Filipino dish? Sunanda: Oh, man. It’s hard to pick. I will say my mom’s pancit recipe (noodle dish I would have to write it out), and kare kare (coconut milk or peanut sauce version). I couldn’t pick between the two. I feel like lechon is a given. Does it even need to be said? Sunanda: Ok, so full confession I am not really the cook in my house but my goal is to perfect my mom’s version of pancit. Do you have any upcoming events / programs / even work things that you’d like to mention? 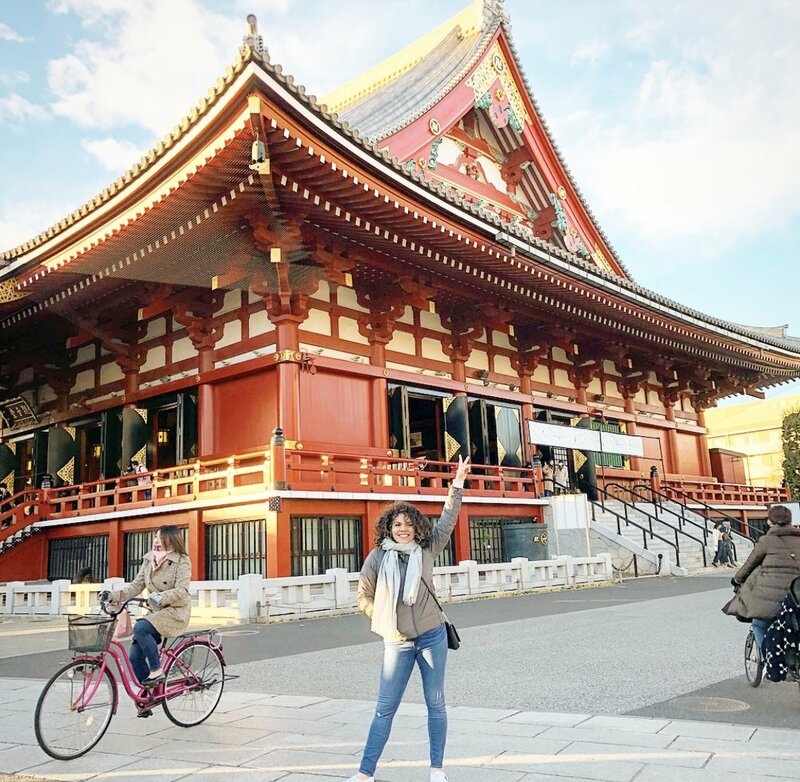 Sunanda: I love a good side hustle and started investing in real estate in 2016. I am always down to talk to people who are interested in it, currently doing it, or both. I consider myself a novice still so the more I talk to people about it the more I learn. I am open to grabbing coffee with people all the time so don’t hesitate to reach out! 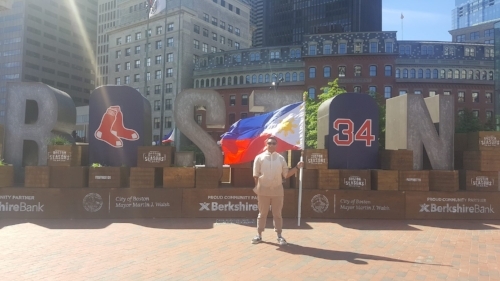 With the Filipinos in Boston series, not only do I try and find people from all different backgrounds and professions, I also try to find people that I don’t know. However this month, I decided to highlight my friend Desiree (Dez) Arevalo because she’s going to be the ring leader of the BOSFilipinos salsa meetup next week. I’ve known Dez for almost 10(?) years now, and she was even a consultant at one of my first startups (not the one mentioned below), something I totally forgot until I was looking through emails and wondering why I asked her for a copy of my license. Dez is a ball of energy and bright light around this community, and I can’t wait for you to learn more about her. So where are you and your family from? Dez: My mom is Puerto Rican and my dad is Filipino, from Davao. 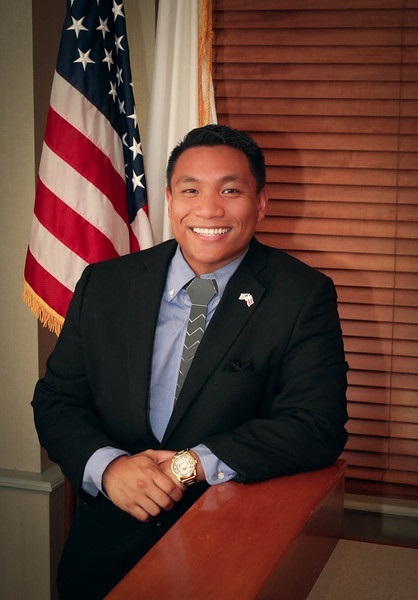 He immigrated here when he was 14 with the rest of the gang, and he sadly has never been back to the Philippines (which will hopefully change this year!). This is extra exciting to ask because I know you just started a new job, but where do you work and what do you do? Dez: I’m 8 days into my new job at WBUR and I couldn’t be more excited! It’s really a dream come true to be able to work with people who are as excited and passionate about community engagement, politics, and bringing unsung stories to light, as I am . I’m specifically working for their newest arm of programming, CitySpace, which is a new venue for public conversation. It’s a space where we will bring content that you hear on the radio to life - think interviews, podcasts, performances, discussions, debates, etc. It’s also a rentable space, so along with companies and organizations, we’re encouraging community organizers and artists to utilize this space to elevate and showcase their work. I know you studied Political Science, but most of your roles have been in operations or events. What inspired the switch? Dez: I actually became an event person by accident. I was working in sales at a diversity and inclusion media start-up, and I had helped with very small event tasks (aka wore many hats as one does in a startup) like registration, helping with speakers the day of, etc. It wasn’t until the event manager unexpectedly moved out of state that I was asked (or pushed) to take a bigger role in the event planning of their signature event, which snowballed into conceptualizing other events and managing those. For the record, I was terrible at sales and sold basically nothing and they probably forced me into the events job as a last hurrah. Another reason I’m excited about this WBUR job is I get to marry my love of politics and what I’m good at (events) for a living! Dez: Born and raised woop woop! What are your favorite Boston spots? Dez: Too many. I think we are blessed with an amazing food scene and cultural scene. Wally’s is one of my favorite places to go on a Thursday night for their Latin Jazz. Best Puerto Rican food is at Vejigantes in the South End. If you want really amazing but cheap Latino food though, East Boston is the place to go. Endless restaurants of authentic dishes and for super cheap. Coming from the events perspective, are there any events / spots around town that you love? Dez: I tend to be a small community event go-er and Dudley Cafe is my go-to and always has some poetry slam, author reading, community forum, or paint night going on. They’re also in my hood and (sadly) the only non-franchised coffee shop in Roxbury right now. AMAZING coffee and quick food, BTW. Dez: SINIGANG 100%. I was vegetarian for over a year at one point in my life, and my lola’s (grandmother’s) sinigang was the dish that broke me! Dez: Ube anything. I usually make a large batch of regular ube, then make ube cakes or ube ice cream, straight ube on a spoon. Can’t go wrong with that purple root of pure love, man. Dez: I’ve recently returned to the Twitterverse! I’ll be mostly posting about cool events and happenings at WBUR and the greater Boston area there. I can be found at @iamDEZisme on both Twitter and Instagram. Holler bizzle peeps! Happy New Year, BFers! We’re kicking off 2019 with an awesome new profile: Alyssa Vaughn. While I haven’t met Alyssa in person, we connected over social media and I was totally fascinated by her work with Teens in Print. Thank you Alyssa for taking time to chat with BF, and I hope y’all enjoy learning more about her! Alyssa: I was born and raised in St. Louis, Missouri. My mom’s family immigrated to the Midwest from Cavite City. Alyssa: I work full time at a nonprofit called WriteBoston, where I manage Teens in Print, an after school newspaper journalism program for Boston public high school students. I’m also currently the editorial fellow at Scout Magazines, the hyperlocal bimonthly magazines of Somerville and Cambridge. Basically, I spend my days designing lessons to teach my budding writers the basics of journalism, and I spend my evenings and weekends making sure my own journalism skills stay sharp! Can you tell us a little more about how you got started with Teens In Print? Alyssa: After college, I knew I wanted to work in journalism in some capacity, but I wasn’t sure how. I was also interested in spending a year serving in the AmeriCorps program, as I participated in a lot of community service throughout my high school and college years. As I was looking through the AmeriCorps positions available in Boston, I came across a position with Teens in Print, and it seemed like the perfect way to both serve the community and pursue my interest in journalism. After my service year, I was fortunate enough to be hired by WriteBoston as a full time staff member—so now I get to continue teaching journalism and working with amazing kids, but with a real salary instead of that tough AmeriCorps stipend! Alyssa: This is my sixth year here—I moved here originally to attend Boston College. Alyssa: I’m totally partial to Cambridge and Somerville since I spend so much time learning and writing about those communities. I love Bow Market in Union Square (I’m eagerly awaiting the kamayan dinners that will be hosted there at Ellie Tiglao’s Filipino restaurant, Tanam!). I cook a lot, so I also love to poke around the city’s specialty food shops, like Capone Foods, Formaggio Kitchen, and the Central Square H-Mart. I also appreciate all the beautiful outdoor spaces we have in this part of town—North Point Park is my favorite place to sit outside and read in the warmer months. Alyssa: As you can probably tell from what I do for a living, I’m passionate about building community through writing. I’ve actually written for the local magazine of every city I’ve ever lived in because I love to uplift people who are doing amazing things right in my own neighborhood. I think that storytelling is an incredibly powerful force, and that when you read about your community, you can’t help but feel more connected to and excited about it. I feel really lucky to have a career that’s focused around facilitating that connection. Alyssa: That’s such a tough question! The winner has to be my Nana’s pork adobo. Alyssa: Chicken adobo was one of the first things I learned how to cook, and I make it ridiculously often. I just follow my mom’s method: I lightly sear about a pound and half of chicken thighs in a pot, then pour 1/2 a cup of vinegar, 1/2 a cup of soy sauce, and all the garlic in my apartment over them. There’s also nothing quite staining my clothes and making my whole house smell like oil while frying up a batch of lumpia. Alyssa: Follow me on Twitter! We’re always looking for BOSFilipinos blog writers / subjects! If you’d like to contribute or have any suggestions, feel free to send us a note: info@bosfilipinos.com. I had the pleasure of meeting Hyacinth at the last BOSFilipinos meetup. As we were chatting I thought she’d be a great person to interview for our Filipinos in Boston feature because she’s done an awesome job of combining her passions. I hope you love learning about Hyacinth as much as I loved meeting her. Hyacinth: I am a proud Cebuana. I was raised in a town called Minglanilla. Our claim to fame is an Easter festival called Sugat-Kabanhawan, which commemorates Jesus’ resurrection. Festivities start at dawn on Easter Sunday. There’s pyrotechnics, street dancing, angels on harnesses, and a giant eagle. It’s pretty awesome. 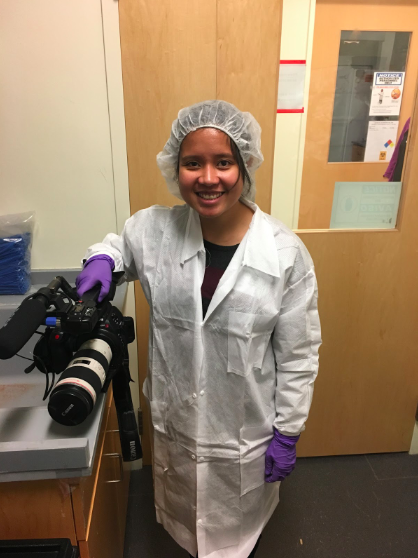 Hyacinth: I am a multimedia producer at STAT, an online news publication that covers biotech and research. I create mini-documentaries, often profiling scientists and their work. I also create animated explainer videos that walk viewers through how something works. Occasionally, I also produce The Readout LOUD, a weekly biotech podcast. Tell us a little more about your path to becoming a multimedia producer. Hyacinth: In second grade, I was telling everyone that I was going to be a TV journalist -- mass communications was going to be my college major. This baffled my teachers because I was a pretty shy kid, but I knew that I was destined to wear a press badge. All the while, my interest in television never waned, and I started volunteering at my school’s student-run TV station. Amidst the tangled cables and cameras, I never felt more at home. Sometime between microscope-induced eye strain and tripping on cables, I found out that there’s such a thing as science journalism, which allowed me to meld my love for science and television. I got a master’s degree in health and medical journalism from the University of Georgia, and now I get to produce my own videos and show the world how cool science is. Hyacinth: I have been in Boston for over three years. Hyacinth: I love getting ramen at Santouka. You can also never go wrong with dumplings at the Gourmet Dumpling House. I also enjoy seeing strange and quirky films at the Coolidge Corner Theatre and watching plays and musicals at the Huntington Theatre and the American Repertory Theater. Are there any Boston-based programs that you love? Hyacinth: When I first came to Massachusetts, I got involved with Catholic Charities. They do amazing work helping refugees navigate life in the United States. I got assigned to help a refugee learn English, and it’s been great seeing his language skills improve over the past couple of years. Hyacinth: My mom’s dinuguan. Hands down. A very close second is sisig. 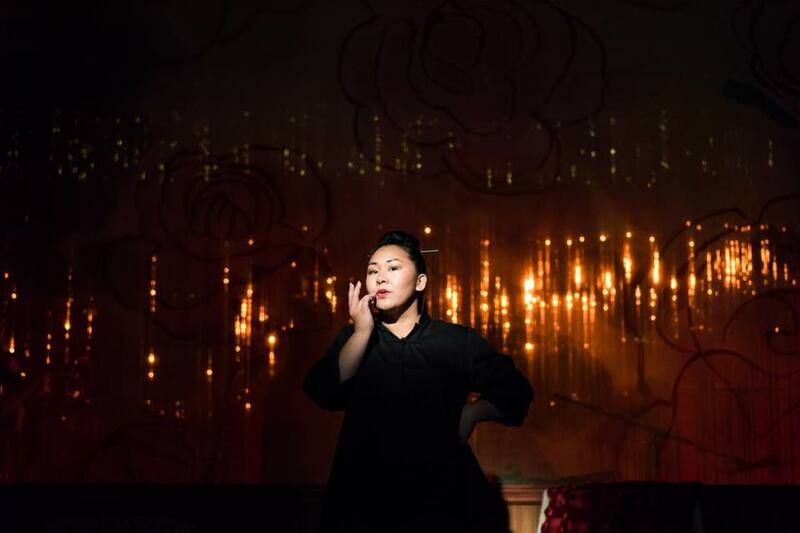 Hyacinth: I like to make lumpia shanghai and bistek. I also like making leche flan. It’s my go-to potluck dish. I don’t really know how to make a lot of Filipino dishes yet. But since moving to Massachusetts, I’ve been craving a lot of my mom’s cooking. So, I often FaceTime with her, and she walks me through all the steps. Recently, we made pancit and chicken tinola together. I’ve yet to have her teach me how to make dinuguan, though. Hyacinth: Check out my latest videos on Twitter and find out what my latest plant baby is on Instagram, both @sayhitohyacinth (Twitter / Instagram). You can also find my latest stories at www.statnews.com. Before we started BOSFilipinos and I was still in the consideration phase of my Filipino food project, the universe kept asking me, “Have you talked to Ashley Lujares yet?” And by universe I mean, Ashley’s previous colleagues at Myers+Chang, Chefs Joanne Chang (owner / chef), and Karen Akunowicz (partner / executive chef), and Veo Robert (chef de cuisine). Seriously, three separate conversations, three suggestions that I should chat with Ashley. After meeting her at an industry night, and then having a coffee chat that lasted for hours talking about our upbringings as Filipino Americans, I thought she’d be perfect for the blog! Ashley is one of the amazing chefs in Boston that is bringing Filipino food to the masses by highlighting special dishes wherever she goes. We’re stoked that she was able to do this interview with us. And don’t worry, we’ll be highlighting more of the amazing Filipino chefs here in Boston throughout the year. Ashley: I was born and raised in Massachusetts, but my parents are both from the Bicol region in the Philippines. Half of my mother's siblings reside here as well as the west coast. And my maternal grandfather was in the U.S. Coast Guard. He was stationed here in Boston and in San Diego, CA. Ashley: I am the savory chef at Flour Bakery + Cafe in Fort Point. Ashley: Many situations in my life have inspired me to become a chef. The first inspiration came from a day I was watching cartoons and my dad said, “Why don’t you watch something that you can learn from. You are rotting your brain.” He put on PBS, and Julia Child’s show was on. I was instantly hooked! Soon after that I moved to the Philippines for 3 years, and one of my earliest memories is going to the market with my grandmother. My cousin Joy and I would take turns going there with her, and I would throw tantrums when it wasn't my turn. I loved how full of life the market was; I loved the smell of the street food and seeing fresh produce. My grandmother owned a pancitan (noodle factory). She also had a green thumb and planted all of the fruits and vegetables in our backyard. Any exotic fruit you can find at your local market in the US, my grandmother had in her backyard. My grandfather owned a balutan (balut factory), and my aunt raised pigs and sold meat at the town market. She also helped my mother prep for parties. Through those parties my mom taught me the importance of eating with your eyes first. 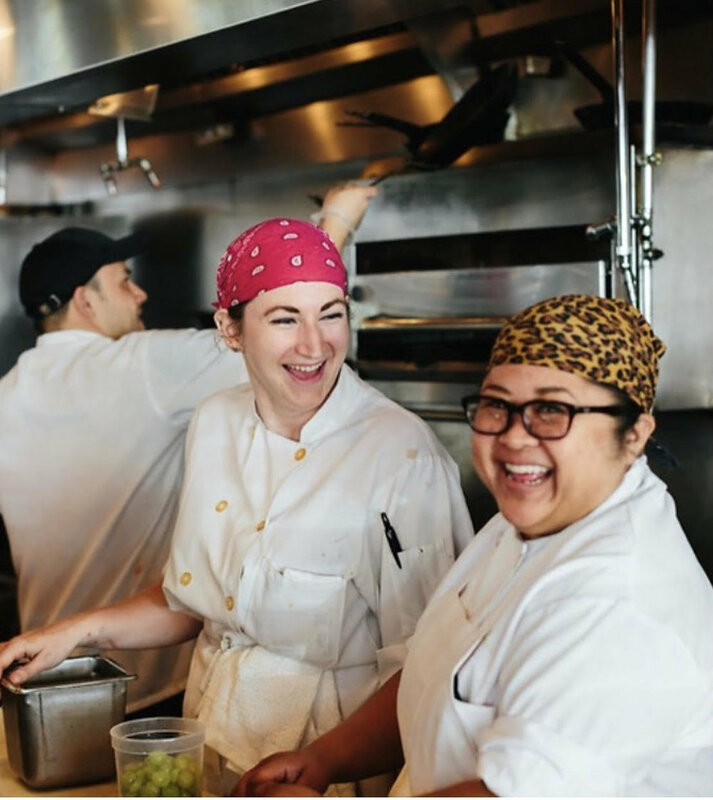 Well we know that Flour is one the best places to work in Boston (like really, not just because of the sticky buns), but how did you end up working there? Ashley: I was the sous chef at Myers+Chang for a few years and I needed a change. I love Joanne Chang’s management style, and I felt like I would learn a lot about how to be a better manager from her as well as the business aspect of the food industry. Ashley: I have been in Boston for the majority of my life. I briefly lived in different places like New York City, the Philippines, and San Diego, CA. Ashley: My favorite restaurants are Sarma, Coppa, Toro, and my best friend’s family restaurant in Chinatown called Wai Wai’s. I frequent the back of the ICA overlooking East Boston, and I love going to museums like the MFA, ICA + Isabella Stewart Gardner. Mostly I'm in the South Shore where the Lujares family compound is located. Ashley: I really love my mom’s palabok (variation of Filipino noodle dish, pancit). It’s so rich yet so bright! I also love my mom’s lumpia shanghai (spring roll). Through the years she developed these recipes and made them her own, and both are her signature dishes. Ashley: I love making Filipino barbeque and my grandmother’s atchara (pickle made from grated, unripe papaya). These components complement each other well, and they remind me of summer. I often make these at Flour! Ashley: My Instagram account is serajul. It’s my last name backwards if you are wondering where I got it from. If you’re an avid BOSFilipinos reader, you’ll notice that all of our pieces this month are about really awesome women. While some may see this as a ploy for Women’s History Month, to be honest, it wasn’t planned. How did we find these rad ladies? By using our networks, but also committing to go past them to elevate community voices through content like our blog and programming like our eatup (and upcoming meetup). And while the BF founders do this for fun, I was so excited for this interview with Melissa Obleada, who gets to work on diversity initiatives for a living! Melissa and I connected when she started following BOSFilipinos on Twitter, and I fell down a rabbit hole looking up all the great stuff she does in the community. Thank you Melissa for taking time to chat with us this month! Melissa: I was born in New York City, and then we moved to the suburbs in New Jersey. My mom is from Santa Maria, just outside of Manila, and my dad is from Lucban, Quezon. I haven’t been to Lucban yet, but Santa Maria has a Dunkin Donuts so it feels like home. 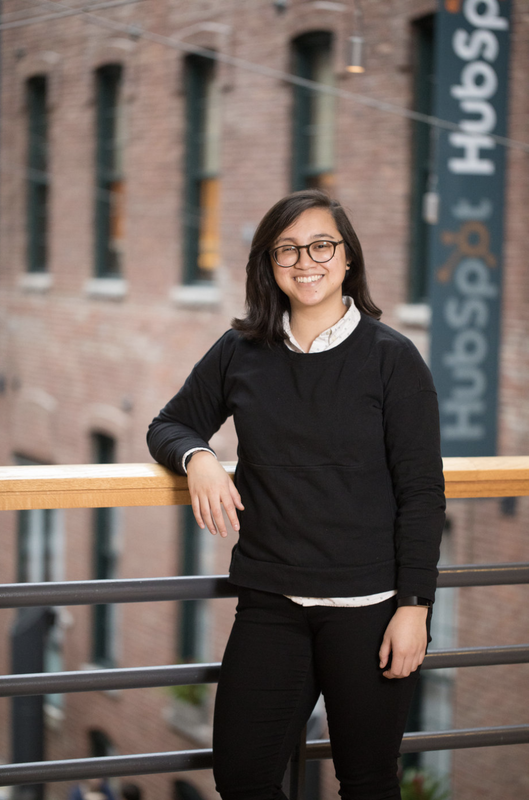 Melissa: I’m the Diversity & Inclusion Program Manager at HubSpot, a marketing and sales software company located in East Cambridge. I plan events and initiatives for two of our four resource groups – People of Color at HubSpot (POCaH) and the LGBTQ+ Alliance – as well as work to see how we can make our company more diverse, equitable, and inclusive. I see you started out in marketing at Emerson (woohoo Emerson alumni!). What inspired you to get involved in diversity and inclusion? Melissa: Yes, go Lions! Good question. The gist of it is, as a queer, cancer-surviving daughter of immigrants, I found myself caring more about the state of D&I at our company than I did about my job at that time, which was mainly focused on employer branding. I was a founding member of our LGBTQ and POC employee resource groups, and was in a unique position. Unlike my colleagues, my role was already focused on employee engagement, and I reported directly to a C-level executive, Katie Burke, who’s a huge advocate for D&I. My access to top leadership and wiggle room in my original role allowed me to spend most of my time focusing on these ERGs (employee resource groups). After about a year of this, I became Diversity & Inclusion Program Manager. In a predominantly caucasian and male industry, I think I’m able to bring a unique perspective and voice to the conversation. I want to put in the work now to make sure that other folks who are underrepresented or othered can come to this company and not question whether or not they belong. It’s cool to have my personal identity inspire my professional work. HubSpot seems to be one of the leaders in Boston when it comes to transparency in culture and D&I. What are some things that make HS different, but that other companies can emulate? Melissa: When it comes to our culture, we think differently than most companies and that’s what sets us apart. A lot of people think a company’s culture (or vibe, feel, secret sauce, etc) is something that just is. But one thing that HubSpot did early on was write down our company values and all the things that make us us. (Shameless plug for culturecode.com.) Having that general framework keeps us from losing sight of what’s important to us as a business. We have a cute acronym called HEART that we use to describe the things we look for in all of our employees: humble, empathetic, adaptable, remarkable, transparent. We apply HEART to everything we are and do. So in the context of creating an inclusive company, humbleness allows us the space to ask questions and learn from one another, empathy helps us understand one another, adaptability has us making sure we’re making the necessary changes to improve, transparency has led to us publicly posting our diversity data, and remarkability pushes us to not just tackle low-hanging fruit, but make the big changes. Open and transparent communication in any organization when it comes to new challenges or obstacles ensures that everyone is on the same page, while closed door conversations and secrecy breed paranoia and distrust. Companies should be as honest with employees as they can be about diversity & inclusion efforts, goals, and initiatives. Melissa: I’d been coming to Boston on and off since I was 10, since my oncologist is here and my radiation treatments were also here back in the day. I’ve been in Boston full time since 2010 when I came for school. I love the MFA, especially alone. My Emerson ID got me in for free in school, and it might still work. When it’s nice out, spending time along the Charles on the docks by the Esplanade is the best. Beware of geese, though. InnerCity Weightlifting is the only reason I’ve kept up with my New Year’s Resolution. You have to try Manoa in Cambridge. It’s the best poke, and the staff are great. Melissa: I organize Queers with Beers at Aeronaut Brewing Company in Somerville. It’s a very chill space for folks of all identities and orientations to come and hang out. It’s the first-ish Monday of each month. Like us on Facebook! Melissa: Empathy. I’m good at being able to understand things from other people's’ perspectives. My awareness of my own feelings as well as the spoken and unspoken messages coming from other people is very helpful in the work I do. Melissa: My mom’s lengua (beef tongue or ox tongue). She prepares it in a mushroom sauce, and it’s the best thing in the universe. Also her arroz caldo (Filipino-style rice congee). Perfect on cold days. Or all days, actually. Melissa: Whoops, I can’t cook Filipino food... The best I can do is making my own garlic fried rice (sinangag) with an egg and tocino (Filipino-style cured pork) or Spam from the grocery store. I guess we’d call that tocsilog and spamsilog. I really want to try to make my own pan de sal though. Please, send me your recipes. Melissa: @MelissaObleada on Twitter and Instagram, probably the only Melissa Obleada on LinkedIn, and hello@melissaobleada.com. 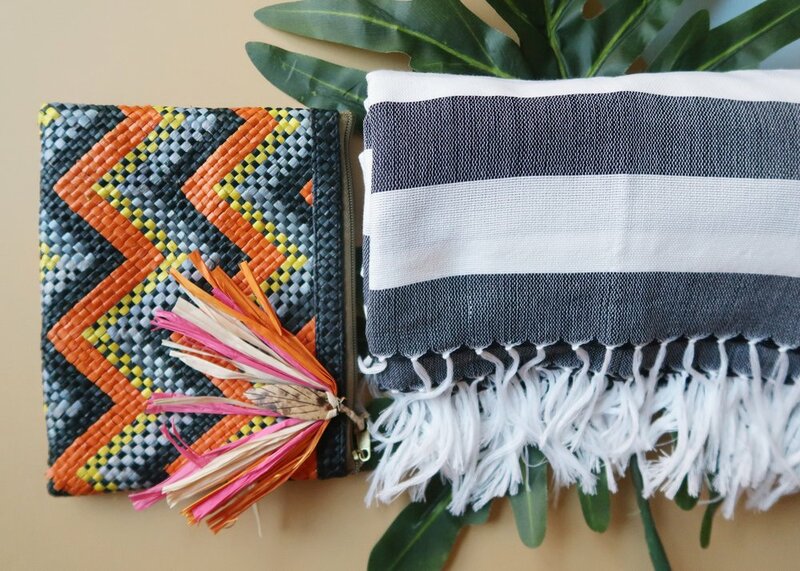 As soon as I first heard about kubo, a line of handcrafted goods by Filipino artisans, I was immediately drawn to the bright colors and the beautiful designs. All kubo products are handmade in the Philippines, and feature traditional Filipino techniques, combined with a modern aesthetic. I chatted with co-founders Rumples Estacio-Miranda and Katrina Pesigan to learn more about them and their products. Where are you from originally? Where do you live now? Rumples: Kat and I are sisters. We were both born and raised in Manila. I moved to New York City in 2013 to study Fashion Merchandising in at Parsons. Kat: I moved to New York City in 2008. Rumples and I are both married with kids and live with our families in Brooklyn now. Rumples: I am the co-founder of kubo together with my sister. 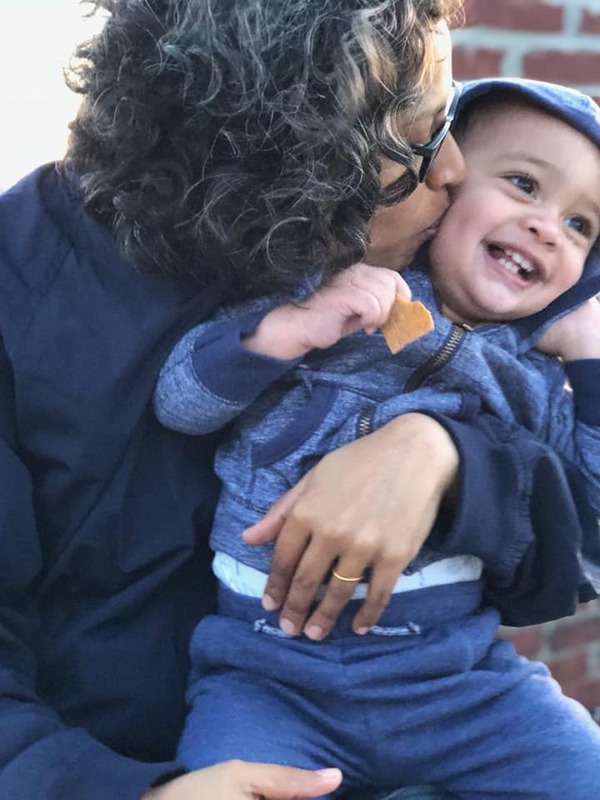 I am also a full-time mom to my 16-month old son. Kat: I work as a public health consultant and am building the business of kubo with my sister. What is kubo? What inspired you to start it? Rumples: kubo is short for “bahay kubo” in Tagalog and refers to a traditional Filipino home. kubo creates consciously crafted goods for the modern lifestyle through partnerships with local artisan communities in the Philippines. We take pride in the recognition of traditional Filipino craftsmanship and opening it to a global community. Kat: kubo is a reminder of home and the comfort it brings. We launched during the Summer of 2016 with a mission to stay connected to our roots, promote traditional methods of craftsmanship, and to sustain the communities that make them. What's your favorite piece from your line? Rumples: The Bayong Tote is my favorite piece in our latest collection. 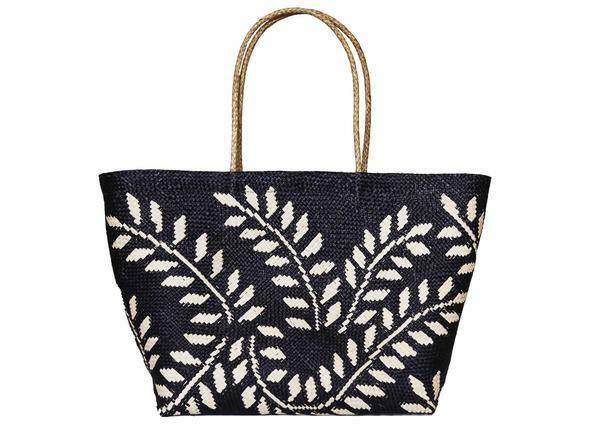 It’s a reinvented version of our bestselling Boho Tote. It can fit a lot of stuff and be used every day - as a work bag, a shopping tote, a beach bag, or whatever! Kat: My favorite piece is the Inabel striped throw - it is a true all around piece. I take it with me whenever I travel. It’s great to have, especially if you have kids. I have a 7-year old and a 9-month old, so the throw is a staple in our stroller. What's been the most memorable story you have since starting your business? Rumples: The firsts are always memorable - our first online order, the first summer market we joined, our first pop up, first collab with another brand. Kat: Also being able to meet fellow entrepreneurs in events, on social media, through peer connections - there is no shortage of advice and support! What's your favorite Filipino food? 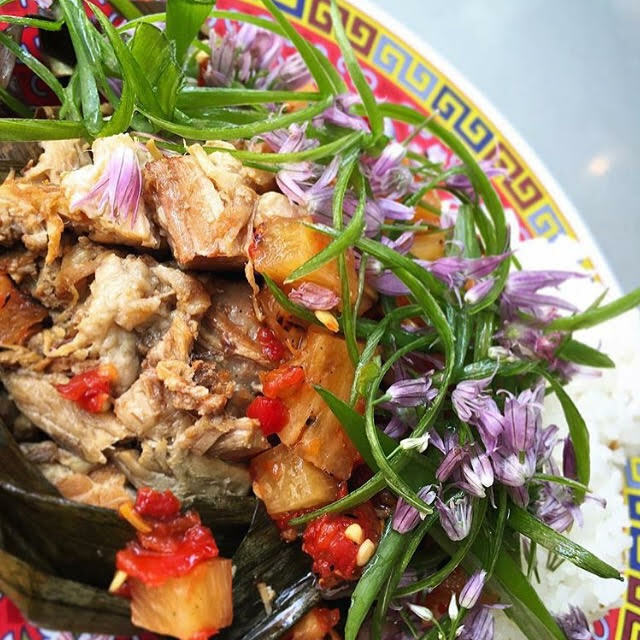 Rumples: It’s such a tough question to answer because I absolutely love Filipino food and I can’t really pick just one dish. My list of favorites include adobong pusit (adobo-style squid), my lola’s (grandmother’s) kare kare (meat and vegetable stew in peanut sauce), my mom’s binagoongan (pork sauteed with shrimp paste), and my mother-in-law’s adobo and monggo (mung beans). I also love taho (sweet silken tofu snack) and I miss it oh so much! You just won't find anything like the street vendor taho we have in the Philippines here in New York! Kat: I love chicken inasal (grilled chicken). I say that because I was recently in Bacolod and had the most amazing chicken inasal ever! Where can we find kubo? How can people get in touch with you? Rumples and Kat: kubo is available online at www.kubomodernliving.com. We are also an Instagram @kubomodernliving. Stay updated by signing up for our newsletter through this link. Thanks so much, Rumples and Kat! This dynamic duo created a discount code exclusively for the BOSFilipinos community! Use code BOSFILIPINOS to enjoy 10% off your purchase until 3/31/18. You can also share this discount link via email or social media. Your discount will automatically be applied at checkout. Saima Kazi is a half-Bangladeshi, half-Indian Muslim living a foodie life in Boston. Saima has a story to tell and it starts (where most of our stories begin) where she grew up: the Philippines. Saima was born in Bangkok, Thailand, moved to the Philippines later in elementary school, and lived the rest of her formidable years there. She then moved to Boston for college and has been here ever since. Saima and I have been friends, best friends, since the 6th grade (although she will claim it was the 4th). Like any close friend, she has been a part of many of my life transitions, she was even my maid of honor. She is the reason why I actually live in Boston. Well technically, she was the person who convinced me to move to Boston from the Philippines for college. The reason why I’m still here, well, I ask myself that every winter. It could have something to do with Saima’s cooking. If you ever have her cooking, you’d probably stay in Boston too. 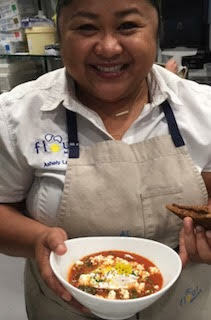 Saima is one of the first members to join BOSFilipinos, and was a sous chef for our Filipino Food Pop-Up last September. When we host our monthly Filipino food potlucks, Saima's contributions are the first to be cleaned out. Anyone who has tasted her food will agree that she's an incredible cook. And anyone who meets her will also agree that she completely lives and understands the Filipino way of life. Leila: This might be a loaded question but, where are you from originally? Saima: I inherited the ethnicity of being from Bangladesh, but moved to the Philippines from Thailand where I was born. I grew up in the Philippines which is where my most coherent years were spent (i.e. teens), and it’s where I feel the most connected, like the culture and the food. Mainly because I was surrounded by Filipinos. Leila: What do you do? Saima: I help manage a boutique in the fashion retail industry. Leila: What’s the best part of your job? Leila: What is your favorite thing to do in your free time? Saima: Cook new things, spend time with my Besties, dance with my handsome Haitian boyfriend, and catch-up on Netflix. I’ve been watching Downton Abbey lately. Leila: What is your favorite thing to cook? Saima: Oh boy! Another loaded question. Adobo, Pinakbet, Arroz Caldo, Munggo, Thai Meatball Curry, Haitian Chicken Stew, Biryani, anything with a fried egg on it. I could keep going but those are in rotation in my kitchen. Leila: Is that influenced by your background? Saima: Oh yes! Thai I picked up from spending my early years there. At home, we cooked Indian, and most of my latter years was spent in Filipino restaurants and homes. But it’s not just the food, it’s the people that I’ve come across that have influenced my cooking (you and your mom are a BIG part of it). I was born into a conservative Indian family forced to follow rules but the Philippines brought me sunshine, tanduay rum, dried mangoes and introduced me to the other aspects of non-conservative ways of life, like binge eating, drinking, dancing and singing karaoke. I mean who doesn’t want a piece of the Philippines?! Leila: How did you learn to cook? Saima: Well, I never had to cook until I moved to the the States. I am a foodie so when I left the Philippines I craved it a lot. I thought about the flavors that I missed and enjoyed the most, so I took my favorite flavors, and learned to cook by trial and error. Leila: When do you plan on going back to the Philippines? Saima: When they eradicate all lizards. Hate them. Or when there’s a wedding to attend. That’s when all of the best Pinoy foods come out to play (except lechon, I’ll never know the true deliciousness thanks to my religion). So there you have it folks. A little peek into the life of my friend, Saima. I’ll bet you may think that you have a boring life, but really, like Saima, you have a story to tell too! We want to hear your story too! Or if you know of anyone that has a story to tell, or that you want to interview please let us know! Send us an email at info@bosfilipinos.com or hit us up on social media and we'll get back to you ASAP.